It was well before sunrise when my alarm sounded. Yesterday’s scouting trip laid the groundwork for today’s mission. It is a simple plan really — all Shane and I have to do is retrace our steps from yesterday, but an hour earlier. Two shots await us in the Virgin Narrows. I put on my dry pants, laced my boots, and we hit the road. Let’s be clear about something here. Hiking up a river at night is not something I recommend. Though the Virgin River was flowing at very safe level, it is difficult to judge the current, and the depth of the water by headlamp alone. With the knowledge gleaned from Day 1, I felt comfortable starting this hike well before sunrise. Otherwise, I wouldn’t have attempted it. I wasn’t looking forward to the deep stretch of water that stood between us and our early morning shooting location. It is difficult enough to juggle a 75lbs pack while wading in nearly chest deep water. Doing so in the dark makes it all the more challenging. The deep stretch must be crossed along a narrow, submerged sandbar. The edge of the sand bar is precarious at best. It has a tendency to crumble, sending the unfortunate hiker into deeper water. We approached the deep section, and stowed each others hiking poles. A sure footing was guaranteed so long as you follow the narrow sandbar. I took off my backpack, resting its full weight on my knee. I was standing in shin deep water along the right wall. I lowered my head, and hoisted the pack onto my shoulders. The weight shifted, and I took a step forward to compensate. The backpack snagged my headlamp, sheering it from my head. It dangled precariously. Without the headlamp, I couldn’t see. I shifted my weight, and caught the headlamp with my right hand just as it broke free. Pain surged through my left shoulder as I strained to control the momentum of the pack with my left arm. I regained control, and put on the headlamp. Finally able to see, I made my way across the deep section of water. I nicknamed this stretch “Zion’s Alarm Clock.” The water level was slightly higher than my drypants — leading to occasional busts of vivid awareness. We made our way upstream until we reached our first shooting location. Our timing was perfect. It was an hour before peak light on the first glow. With no dry ground in the immediate vicinity, I stowed my gear downstream on a rocky riverbank. I assembled my camera, and ported it some 50 yards to the shooting location. In this magnificent stretch of the narrows, the river is only 30 feet wide, and flows wall-to-wall. A beautiful orange glow skims across the chiseled canyon walls, resulting in a mysterious sort of light — unlike any glow I’ve ever photographed. When combined with the green hue of the river, the scene has a tranquil, subterranean vibe. I used a polarizing filter to help control the reflections on the surface of the water. I held it to my eye, turned it until the surface reflections disappeared, then backed it off a tad. It’s important to leave a bit of glare to give the water more dimension on film. I noted the number on top of the filter, screwed it to my lens, and properly aligned it. It would have been impossible to judge the effectiveness of the polarizer while viewing the dim ground glass. The best glow was only 20 minutes away — I began metering the scene. Two years ago — almost to the day, I attempted to take this exact shot. It was my first time in Zion with the 8×10, and I was unfamiliar with the many technical aspects of large format. My composition was solid, but the photo was horribly soft. I learn best by making my own mistakes. Seeing those soft, poorly exposed transparencies taught me an important lesson. At $20 a click, I’m a fast learner. I chose color negative film to shoot this photo. Known for it’s ability to show detail with high contrast scenes, color negative film also provides a nostalgic feel — which I’m learning to embrace in my landscape photography. The first exposure was on Kodak Ektar 100. I left the shutter open for 11 minutes at f/45. This exposure time compensated both for the polarizer, and reciprocity failure. Upon replacing the dark slide, I realized the back of my camera was loose. The film holder and ground glass are held in place by two metal sliders. When properly secured, the fit is snug. Otherwise, the film holder can move, and light can potentially enter the camera. This is a VERY bad thing. I immediately recognized my error, and used a second film holder with a sheet of Kodak Portra 160VC. This film is more sensitive to light, which allows a faster shutter speed. I snugged up the metal clips, re-cocked the shutter, and took a second photo. This time, it was 7 minutes @ f/45. The first shot suffered from technical issues from the unsecured camera back. Luckily, the second shot turned out great. This shot was 2 years in the making. My ability to properly capture this scene is a testament to my personal development as a large format shooter. Keep in mind that this is just a quick flatbed scan of the film. Other than a bit of dodging and burning, I haven’t done much in Photoshop. With the first shot under my belt, I moved to my second location. I debated between a horizontal and a vertical composition. Though I prefer to shoot horizontal as much as possible, a vertical composition placed emphasis on the beautiful glow. At this location, the Virgin River zig-zags down a long stretch of canyon. Direct light strikes the right wall, illuminating this grand corridor in a spectacular glow. The shooting window ends abruptly when direct light spills into view. I selected my normal lens (300mm) and used a polarizer to control excessive glare in the foreground. I began by taking two bracketed exposures on Velvia 50. In such contrasty conditions, I’d rather be safe than sorry. I followed up with a single exposure on Kodak Ektar 100 color negative film. 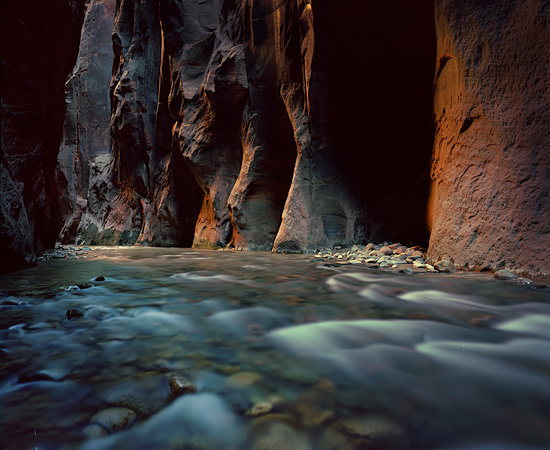 I’ve used Ektar in slot canyons before, and knew it would give good color and tonality. Despite my initial fears of overexposure, the Velvia 50 and Ektar 100 shots showed proper exposure. My preference between the two shots is the one on Ektar. Color negative film better handles the extreme contrast — providing detail in both the shadows and the highlights. For this web presentation, I intentionally kept the shadows dark to restore a sense of depth. The original negative is full of tonality. Just after taking my final shot, a beam of direct sunlight appeared on the right wall. My timing was perfect. Moments later, a gust of wind surged through the canyon and the beautiful light evaporated before my eyes. High overhead, I watched as a band of high clouds sailed past. That certainly explained the gust of wind. These clouds are the angel of death for reflected light. They bounce light down into the canyon, easily overpowering wonderful glows — even if the sun itself isn’t obstructed. The canyon came alive as another gust surged through the canyon. Fall leaves rained down like confetti, and long delicate webs of spider silk floated gently in the breeze. Today was a success. Two shots in one day? That’s almost unheard of. With my bag fully packed, I lifted it onto my knee. In one swift motion, I hosited it onto my back. A sharp pain radiated from my left shoulder. The struggle with my headlamp that morning had a painful consequence. This entry was posted on November 26, 2011 at 11:52 pm and is filed under 8x10, Photo Trips, Photography, Zion National Park, Nov 2011. You can follow any responses to this entry through the RSS 2.0 feed. You can leave a response, or trackback from your own site. Great shots Ben. Regarding your dark ground glass I’m wondering if you use the stock Ebony screen. I once had an Ebony 45SU and hated the screen. Replacing it with a Maxwell screen is expensive but worth the extra brightness and clarity. Thanks Doug. I was certainly happy to get 2 shots in one day. I am indeed using the stock ground glass. I’ll have to look into getting a better one. Also, my 150mm isn’t a particularly bright lens to begin with, so using it in a dark situation only exaggerates the issue of the ground glass. I love both shots a lot, but find Grand Corridor especially stunning. They’re definitely worth the drum scanning. I can’t wait to read your next adventures. Would you mind to share a little about the exposure measurement? Thanks Arnaud. I certainly look forward to what a good drum scan can do to these. Though the flatbed gives a reasonable idea what the image looks like — drum scans are where the magic is. For both scenes, I used my Sekonic 558 spot meter. In the first photo, I metered the far right wall (the one illuminated in the orange glow) at around +1.7. This meant that the dark regions were around -1.5, and the deepest shadows were at nearly -5. I knew the shadows would be very dark, but they were that way in reality. My original negative actually shows a hair of detail in the darkest areas — something that slide film could never do. On the second shot, I made sure the brightest part of the glow didn’t meter any brighter than +2.2 or so. The dark areas were typically between -2 and -3. This negative has a lot of tonality — even in the very dark areas. I also had to darken this one down a bit to restore the dark feeling of being in the canyon. For both shots, I added an extra stop of exposure to compensate for possible reciprocity failure. Also, it’s best to error on the side of overexposure when working with color negative film. What a labor of love. The Grand Corridor shot is especially stunning, and worth everything that went into it. Can’t wait for Day 3! Also appreciate the tutorial on the polarizer, which I’ve never used. Think one would enhance shots in snow? I don’t think the polarizer will do much for snow — but I haven’t tried it so I don’t really know on that one. It does work VERY well when shooting in red rock country though. In addition to the ability to control reflections on water — it helps to remove glare from the sandstone itself, which results in better color. If you don’t already have one, I would certainly suggest buying one. I use one from Heliopan, and another from Hoya — two different sizes for two different lenses. Great, thanks Ben! I just checked at George’s and they rent polarizers, so will try that on my next trip and then buy a good one if it works. Anything for better color! I have walked in the Virgin River and slipped on those rocks! I was ok but could have easily sprained an ankle or worse. That was during the middle of the day, I can not imagine in darkness with 75 pounds of gear on your back! All that effort was worth it though, great shots Ben! Really love the Grand Corridor shot as well. Luckly, the stretch of deep water has a sandy bottom, so there is a good footing. I know exactly what you’re talking about with the slippery rocks though. I have learned to plant both poles before taking a step, then just letting my foot settle where it does — which sometimes involves some degree of ice skating over some of the big rocks. Thanks for the kind words Gary! I couldn’t make Zion this year, but I’m living through your photos and videos. Two in one day is super. I use a DSLR and usually don’t hit two winners in a day. Can’t wait to see the rest. “Grand Corridor” is a phenomenal shot, Ben. I’d say it’s more than worth the struggle, but you’d have to make that call, not me. Thanks Mark! I certainly look forward to seeing these images in print at some point. That’s where the power of the 8×10 really comes into play. I like the look of the color negative film though — it’s something that I’ll certainly be using more often now. The water level was slightly higher than my drypants — leading to occasional busts of vivid awareness. As always… thanks for taking us along for the ride. Sounds like you had a great trip, and the two photographs you came away with on this particular day are both exquisite. Can’t wait to see more, especially when it starts snowing. Thanks David! The snow was certainly a fun experience! With regard to the first frame of the video — I get a choice of 3 different frames, and well, that was the best of the bunch. Kinda funny huh? Took me forever to read this. Yet I still admire your perseverance to get these shots. Amazing work! I can’t imaging doing it!